The Carson-Newman online Master of Science in Nursing Family Nurse Practitioner (MSN-FNP) degree program in Florida is designed to develop a more accomplished and complete advanced practice nurse. This MSN-FNP program helps registered nurses in Florida define their future as an independent primary care provider, and thrive as a Family Nurse Practitioner. The Florida MSN-FNP program is grounded in evidence-based practice, connecting advanced nursing research, theory and clinical practice. Carson-Newman online MSN-FNP students learn to assess their patients from a holistic perspective, looking beyond immediate symptoms to determine treatment based on all available evidence. MSN-FNP graduates learn to provide advanced primary nursing care to individual patients across the lifespan as well as families and entire communities, to position themselves for family nurse practitioner jobs in Florida. The MSN-FNP program prepares Florida graduates to be able to conduct exams, perform diagnostic tests and screening evaluations, develop treatment plans for chronic and acute diseases, and understand the changes in health promotion throughout the aging process. To manage overall patient care regarding development and lifestyle issues, prescribe medications and emphasize disease management and preventative care, the MSN-FNP program builds advanced proficiency in pathophysiology, research, assessment and pharmacology. Florida students learn to solve complex problems and make confident decisions based on evidence and understanding of your patients at a deeper level. With an average annual salary of $100,000, the Nurse Practitioner field is projected to grow by 31% by 2026, covering many specialties including pediatric health, adult and geriatric health, psychiatric and mental health, and more. Florida is known as the Sunshine State and most of it is on a peninsula that points southeastward from the North American continent. Florida is bordered by the Atlantic Ocean to the east, the Gulf of Mexico to the West, and stretches towards the Caribbean Sea southwards. On land, Florida is bordered by Alabama on the northwest and by Georgia on the northeast. The closest foreign territory to Florida is Bimini in the Bahamas, which is located 50 miles east of its southern tip. The Florida Keys, which form the southernmost part of the state, stretch to within approximately 75 miles of the Tropic of Cancer. The coastline of Florida is over 8,400 miles long and about 5,100 miles of its shoreline is along the gulf. Florida’s economy is based primarily in tourism, which has surpassed manufacturing and agriculture as its main component. 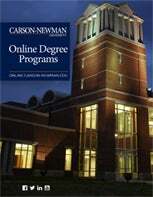 Carson-Newman University is a Christian liberal arts college located in Jefferson City, Tennessee. Our online MSN-FNP program, designed for the professional working nurse in Florida, offers a flexible way to earn your MSN-FNP on a schedule that you can tailor to accommodate your busy lifestyle. The online MSN-FNP program is accredited by the Commission on Collegiate Nursing Education (CCNE) and the Southern Association of Colleges and Schools (SACS). Carson-Newman was ranked #26 in Best Value Schools (2018), #66 in Best Regional Universities South (2018) and was named as a “Great School at a Great Price” (2017) by U.S. News & World Report. Earning an MSN-FNP degree can prepare you for independence as a primary care provider who delivers family-focused care in a variety of outpatient settings in Florida including clinics, schools, hospitals, and private homes. Family nurse practitioners are in demand. According to NursingLicensure.org, they carry out advanced assessments, make diagnoses and prescribe and monitor treatments, treating patients across the lifespan by performing symptom-focused examinations, managing common and acute illnesses, and identifying health risks. How Long Does It Take to Become a Family Nurse Practitioner in Florida? Carson-Newman’s online Master of Science in Nursing - Family Nurse Practitioner (MSN-FNP) program prepares Registered Nurses who possess a Bachelor’s degree and an active and unencumbered RN license for advanced practice opportunities such as a Family Nurse Practitioner. It can take as few as 32 months to obtain an online Master of Science in Nursing - Family Nurse Practitioner degree after earning a BSN. Carson-Newman’s (C-N) online MSN-FNP program allows working nursing professionals in Florida to balance a busy professional life with higher education goals. With a distinct curriculum delivered through an engaging and supportive learning environment, the C-N online learning environment promotes a sense of connection and community while you interact with faculty, support staff and classmates. While earning your degree, you will expand your lifelong career network. The salary for a Family Nurse Practitioner in Florida can range between $98,000-$118,000 according to Salary Expert.